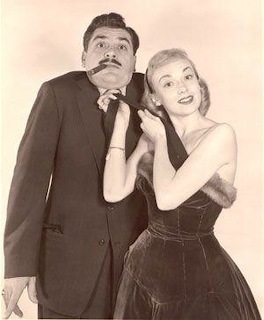 Edie Adams with crazed husband Ernie Kovacs, and in later years. Visionary Dallas Video Festival founder Bart Weiss, who used to elbow the hell out of me in our pickup basketball games, had the pleasure and privilege of knowing and collaborating with Edie Adams. 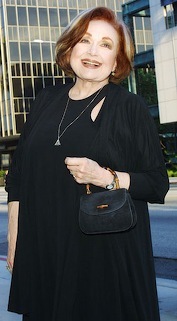 The Ernie Kovacs Award, named in honor of her incredibly inventive husband, was discontinued after 2002. That was largely because Edie, then in her late 70s, had found it increasingly hard to make the journey from her Los Angeles home to be among kindred spirits in Dallas. Edie, Bart, myself, Sylvia Komatsu and Ron Simon formed the board that selected the Kovacs Award winner from 1997 until "we realized that it was just getting to be too difficult for Edie to travel and decided to end the award," Bart said in an email sent Thursday, the first day of the 21st annual Video Festival. I never met her, but did get to hear her debate the merits and demerits of potential Kovacs winners during our teleconferences together. As a kid, I perhaps accelerated a bit toward puberty while watching her then very seductive commercials for Muriel Cigars. The so-called "Golden Age" of television didn't get any better than that. Born Elizabeth Edith Enke on Aug. 16, 1927 in Kingston, PA, Edie passed away on Oct. 15th at age 81. But what a life she led, particularly from Sept. 12, 1954 to Jan. 13, 1962. That was the duration of her storied marriage to Ernie Kovacs, who died tragically on the latter date in a car accident. Edie had kept his flame burning and his trademark cigars smoking ever since. She was a pistol. The very first Kovacs honoree was Joel Hodgson of Mystery Science 3000, followed in chronological order, according to Video Festival news releases, by Terry Gilliam, Robert Smigel, Paul ("Pee-wee Herman") Reubens, Martin Mull, Mike Judge and Bill Camfield, a true D-FW television icon who created Slam Bang Theater and the famed, madcap "Icky Twerp" character -- our own Ernie Kovacs -- back when KTVT-TV (Channel 11) dawned as an independently owned and operated station. I remember being a go-between for Bart at one of those those semi-annual gatherings of television critics in L.A. My assignment was to give the Austin-based King of the Hill creator a manila envelope after a lunchtime Fox interview session had ended. We wanted to gauge whether he'd accept the Kovacs Award as well as attend that year's Video Festival. Otherwise he was to know nothing. So I gave him the envelope, told him something like, "This is really cool, so please read what's inside," and then hastily exited toward another news "event" with David Hasselhoff or somebody. Technology marches on, but at least a semblance of the personal touch never hurts. And of course, Mike was totally thrilled with his Kovacs Award and showed up to receive it. I asked Bart to write down a few thoughts about the woman who made it all possible, or perhaps speak them into a dictaphone or beam them to me. Whatever works these days. "Ernie Kovacs epitomized what television could be. He was an artist who defined and was defined by his medium., who did not stand up and tell jokes but worked with what TV could do. "Edie, who was his widow and collaborator for many years, spent a large part of her life preserving Kovacs' work and going around the world showing it. When we decided to have an award at the festival, it seemed obvious that it should be named after Ernie, and that we needed to have Edie involved. "We also were lucky enough to have Edie come to the festival, show some rare Kovacs work and talk about why it's important. She came year after year, telling stories and showing work. At a festival like this, one of the few perks is the time you get to spend with wonderful people who you would otherwise never meet. And indeed we had some great conversations. "Once, I remember after dinner walking out of the restaurant and the pianist recognized Edie and she sang a few songs. It was magical. Then she sang what I remember as a kid as the Murial cigar commercials she did for many years. Funny that she is known for a cigar when Ernie was known for a cigar all those years and had Dutch Masters as a great sponsor letting him do what he wanted. "Edie gave a lot to Dallas coming all those years and spreading the spirit of creativity. Who knows what Kovacs would do on an iphone." Rest gently, Edie. You, too, Ernie, although neither of these larger-than-life, thoroughly invigorating media giants will ever go gently into any night.